As summer approaches, so do the rains and the humidity. Along with these comes one of the largest problems we face in our little paradise, that of mold and mildew. Especially if someone is planning to lock up their home and hope for the best, replacing mattresses and pillows in the fall can become a ritual. Here is an alternative, that can be beautiful and personal as well as superbly functional… the concrete pedestal bed. The same mattress and pillows can set on this bed frame and headboard, without ever coming into contact with a surface that is conducive to mold. The bed base is made of masonry block or brick, the interior filled with sand or foam. There are two ways to construct the mattress platform and side tables. One way is made with a foam and wire unit called “Tri-di panel”. They are then plastered or stuccoed and given a smooth finish. The other way is more the traditional forming & pouring of cement. This creates an overhang around the pedestal of about half a meter. Room to stash shoes and slippers, with the pedestal filling up the space that normally collects dust bunnies and lost socks. 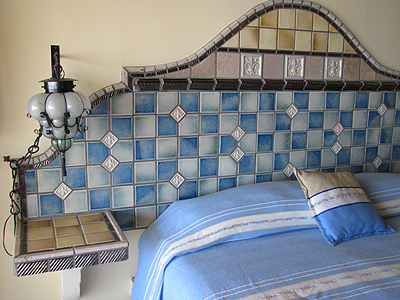 The headboards and side boards are a perfect location to cover with ceramic tile. Everything can be easily cleaned and sterilized. The tile design and the shape of the headboard, side boards, and even the base, can be made exactly to fit any need. The artistic possibilities are endless. The only drawback… it’s tough to rearrange the bedroom furniture…but who ever does that anyway?